Don't send plain letters and memos to your clients and employees. Give your correspondence some charisma. Communicate clearly and boldly with your clients, partners, stakeholders and more. Upload your logo or photo and add custom text to create a cohesive look to all of your correspondence. With Customized Stationery featuring your logo and message, you'll give your clients a quick and easy way to remember you and your business. From monogrammed note cards, to moving announcements, to personalized notebooks, we have a team of printing experts that will create the products of our choice based on your goals and ideas. We have the capacity and capability to create any delightful design to suit any style. 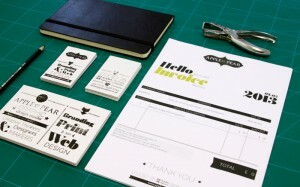 Bring in your stationery for printing or work with our design team to create a unique and eye-catching alternative. Our Customized Stationery is available in a number of styles and unique, full-color designs that are printed on sturdy, high-quality paper stock. Your company name and return address can be added to ensure optimal usability. Be ready for your next business mailing with our complete line of customized stationery. Our stationery printing services offer crisp images and a professional look for all your communication needs.